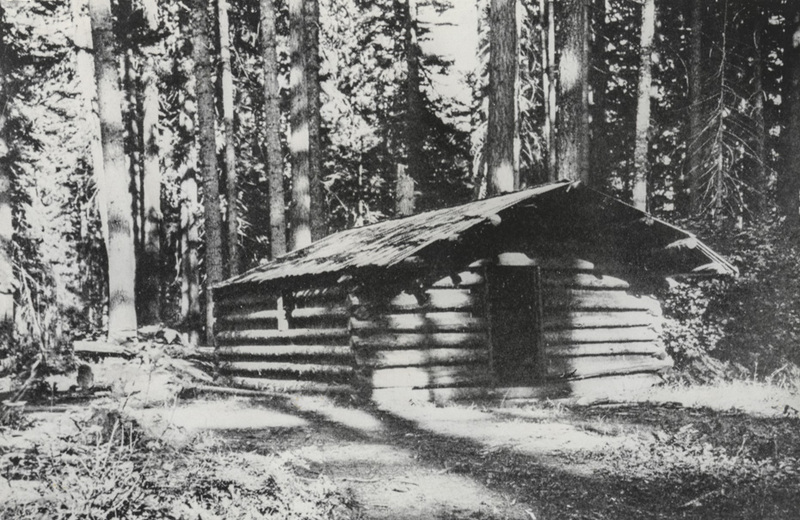 I've been remiss in running a Hood River history blog and not showing this cabin yet. This was the 1852 cabin of William and Mary Laughlin, the first European settlers of Hood River. The cabin was reportedly on the 1100 block between State and Oak, by what is now known as Coe spring. The Laughlins spent one very unpleasant winter in Hood River and left, leaving it to the Coes to establish the village two years later. Nathaniel and Mary Coe used this cabin their first year in Hood River. This image is from a book by the Laughlin's daughter, Elizabeth Lord, entitled "Reminiscences of Eastern Oregon." Her description of life in the cabin that winter is well worth reading. (Part 1, Part 2) She observes that a deep snow fell in November and the ground was covered for the next four months. When spring came they abandoned their cabin and traveled back to the Dalles by canoe. Her memories of the wind and waves between Mosier and the Dalles shows that some things have not changed. Would be a dismal home, as I see no windows. They were not alone as Dr. Farnsworth was with them. They almost starved that winter, sometimes only having deer and potatoes to eat. Mary's maiden name was Yeargain and she was from Illinois. Laughlin later became a very prominent citizen of The Dalles. Reading some of the Laughlin history, it sounds like they had the misfortune to pick a year that a really bad winter hit The Gorge area. Hard to believe that is what the HR hillside used to looked like. Since it is a north facing slope and with all of that heavy timber, it would have a been a dark and dreary location. I wonder if the Heights area was more open? If any of you enjoy history of this area I encourage you to read the Part 1 and part 2 links that Arthur has posted. Elizabeth Lord talks about Nathan Olney in The Dalles. Olney, along with his Wasco Indian wife and children, eventually moved to Fort Simcoe in the Yakima Valley. Roscoe Sheller wrote a book about the Olney family. There are descendants of Nathan Olney living here in Glenwood. What I find interesting is that the trees are big, but not huge, as if the whole area burned a hundred years before this picture. I'm wondering how old the cabin is in this photo. The roof looks old. So I guess because of the way the shadows are going, we may be looking north, towards the river? That location is fairly hilly, but this looks quite flat. This is just east of 10speed/dirty-fingers right? Curious place to build a cabin when no one else was around. I guess it was sheltered, and had a spring though. I should point out that we don't know when this photo was taken. The cabin hung around for many years. I'm sure there weren't any photographs taken until at least 30 years after the cabin was constructed. Another source (A-Z) says the cabin was east of 13th near the spring. I'm told the spring is just S of Montello, between 12th and 13th, near the city reservoir. This is directly uphill from the spot I describe in the Notes section. I almost chimed in earlier, but didn't want to rock the boat, so to speak. I don't have any info anymore, but the site pointed out to me, was on the south side of Montello, about Tenth. As I recall, there was still a spring box located there twenty years ago, probably from the twenties or thirties. The Coe Spring is just east of the house at 1022 State Street. Wonder what the dimensions of the building were? My guess would be that the door is about 5' tall and the interior side wall height is about 6'. I think Jeffrey has the correct spring, the one by Montello must be a different one. A 1961 HR News article describes the spring location as 10th and Oak. Lord says the house was on the east side of the spring branch, with Farnsworth's cabin to the west by the Adams house (on 13th at the end of State). I think the spring branch refers to the creek west of 13th. Laughlin didn't want to be too close to the creek because he thought the moisture would be bad for his sick son. was below the cabin. But with Jeffrey's placement of the spring at 1022 State St., the Henry Coe home at 1006 Sherman St. is above it. map of 1022 State St and possible site area of the cabin. Here is a link to an old photo of the Coe home and the spring house. The link doesn't work for me Jeffrey, but I'm not on Facebook. That might be why. I had to log in to Facebook to open it. The spring house is the structure on the right hand side of the photo. Ms Lord says the Coes used the cabin for a few years and she says it was built in a fir grove. The starving cattle crowded around the cabin. Cattle in a storm will seek heavy timber. The Coes leveled a ravine in the area. Must be lots of cattle bones buried beneath the dirt in that ravine. Seems like it would have been a pretty good hike from the river to the cabin. Dr Farnsworth fell one of the fir trees, fashioned a boat and drug it to the river with a team of oxen. She talks about the Indians using a sail for the boat when they went back to The Dalles. I wonder if they used some kind of sail before the white man appeared on the west coast?